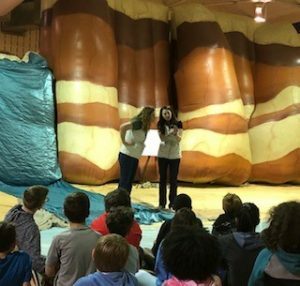 JOHNS CREEK, GEORGIA – Rocky the Big Canyon Balloon set up for a day of geology fun for the 3rd and 5th graders of State Bridge Crossing Elementary on Wednesday. 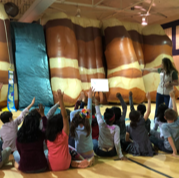 A big thanks to the SBCE PTA for sponsoring the programs through a mini-grant. Students spent their time navigating the differences between erosion and weathering – can you remember the difference? What happens to the “W”? There’s no forgetting erosion…those Bobcats had some sweet moves during the Erosion Dance. Why do we dance to represent erosion? Because erosion is the MOVEMENT of earth materials! 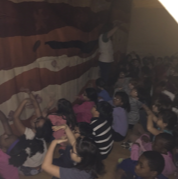 Our programs ended with a trip back in time to the fossil tunnel where we met the cephalopod and the trilobite, explored renewable and non-renewable natural resources and saw the effects of an earthquake underground in the fossil record. Wow! Thanks for a fantastic day of fun, State Bridge! We enjoyed your questions, enthusiasm, hugs, and high fives! You rock!